Aerators, dissolved oxygen machine, pond dissolved oxygen machine, fast aerator,Shrimp tank aerator-Aquaculture supplies related categories-Thingwell Enterprise Co., Ltd.
Model No.：Aerators, dissolved oxygen machine, pond dissolved oxygen machine, fast aerator. 2/4/6/Waterwheel specification Aeration machine/Round rotary aerator/Jet Aeration Machine/High pressure ring blower. Aquatic breeding (aerator), accessories use anti-UV, acid and alkali resistant, impact-resistant plastic, 304 stainless steel, bearings, motor,Good quality and durable. 1.High Dissolved Oxygen (DO) THINGWELL paddle wheel generate the dissolved oxygen higher than other brands do. Because years of continuous R & D and design of THINGWELL larger paddle wheel-used impeller with relatively wide of 220m/m and draft of 90m/m. While THINGWELL paddle wheel can water up to 20M long, therefore, All of the dissolved oxygen can be higher. 2. High quality (long life) THINGWELL paddle wheel life is over 5 years due to high quality spare parts and precise machine processing. The most important parts of paddle wheel are the reducer and motor. THINGWELL reducer and motor are made by the multi-channel precise machine processing to achieve quality standards. 3. Low power consumption THINGWELL paddle wheel can provide a high level of dissolved oxygen and large water flow. THINGWELL motor is the culmination of years of R & D for a low power consumption and high efficiency. By the dynamic balance of motor machine test, THINGWELL motor test report can show the motor loading, low power consumption, and high efficiency. Also there are large torque, however these motor are not easy burned due to the electric current over loaded. 4. High efficiency THINGWELL paddle wheel with high level of dissolved oxygen, large water current, and low power consumption, also durable and long life, especially with the noble era of energy, energy-saving is particularly important to reduce carbon. TK-4/6 impellers Paddlewheel Aerator. 1.Cost-effectiveTHINGWELL ,TK-4/6 paddle wheel is 4/6wheel structure with three/four floating boat and big stainless steel frame while using 2/3HP motor and high-quality reducer so that the paddle wheel TK-4/6 can be more stable and not easy to swing during operation. However, there are four wheel for the oxygen generation and create a bigger water flow and more dissolved oxygen. It can decrease the QTY of paddle wheel use and reduce the cost of purchase. 2.Large and deep water flow THINGWELL,TK-4/6 paddle wheel to compare with the 2-wheel paddle wheel with larger water flow and more dissolved oxygen, the most important to apply in deep shrimp ponds . Due to the large flow and more wide range of oxygen caused by 4-wheel paddle wheel, it is a easy-proliferation for the bottom of the ponds. Applicable to large-scale aquaculture ponds or deep water, high-density breeding, and high level of dissolved oxygen aquaculture. 3.High efficiency THINGWELL, TK-4/6 paddle wheel could provide oxygen for 800kg of black tiger shrimp or for 1200kg of white shrimp ( vanname shrimp ) comparing the 2-wheel paddle wheel for 500kg of black tiger shrimp or 800kg of white shrimp, but also provides a higher level of dissolved oxygen in large. AC: 220 /380 /415/440V/ Three - phase / 50 / 60HZ . 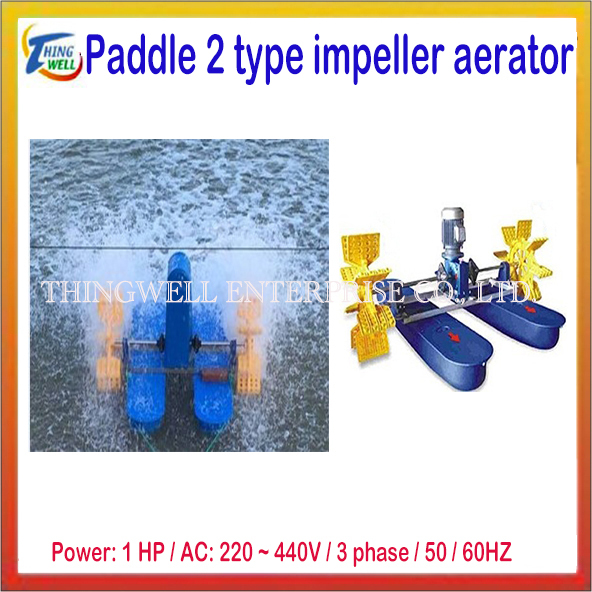 ※ Other models: Water plowing aerator/Wave maker/Super impeller aerator/Splash aerator.